Members of the Organization of the Petroleum Exporting Countries (OPEC) received about $567 billion in net oil export revenues in 2017, up 29% from revenues in 2016. Increases in both crude oil prices and in net OPEC oil exports drove revenues higher in 2017, and EIA expects that revenues will continue to increase in 2018, based on EIA’s August Short-Term Energy Outlook. 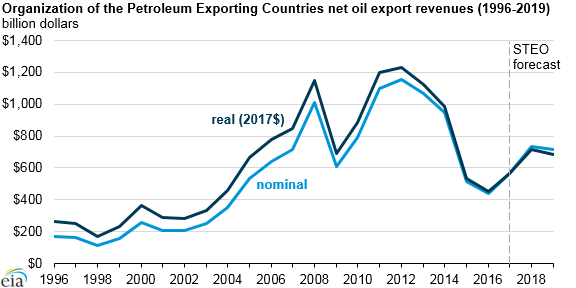 EIA projects that OPEC net oil export revenues will increase to $736 billion in 2018, up 30% from 2017. This expected increase follows higher forecast annual crude oil prices in 2018 and more than offsets slightly lower crude oil production from OPEC members in 2018. OPEC revenues will decline to $719 billion in 2019, according to EIA projections, driven mainly by lower crude oil prices, as well as slightly lower OPEC production and exports. Iraq’s share of total OPEC revenues also increased, reaching more than 12% in 2017, as the country’s crude oil production and exports continued to rise. Iraq’s exports averaged about 3.8 million barrels per day in 2017, despite the shut-in of northern Iraqi production and exports following the Kurdish Region’s independence referendum in September 2017 and the ensuing takeover of Kirkuk area fields by Iraqi forces. Iraq’s crude oil production from the southern fields largely offset the northern Iraqi output losses in 2017.